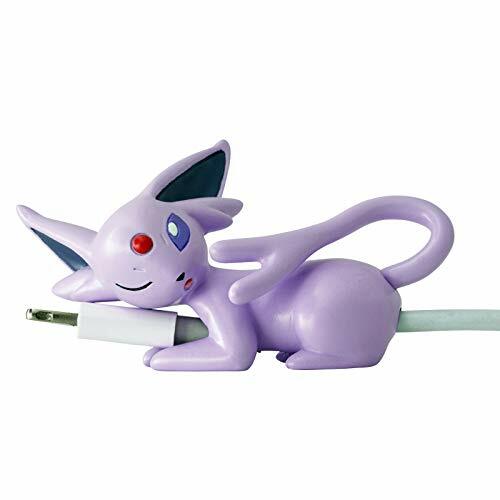 Pokemon “Sleeping on the Cable” cable bites Vol. 3 & 4 were released simultaneously today in Japan. There are 5 new characters in each set. 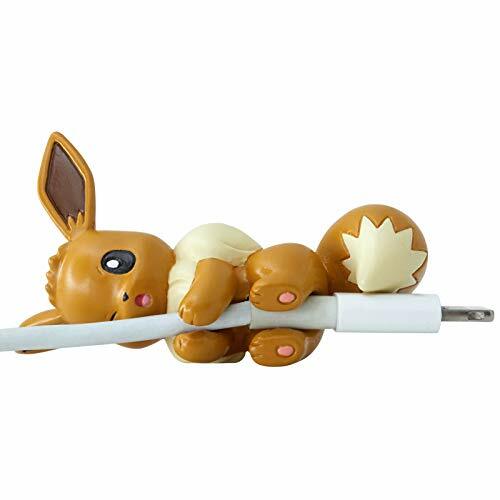 For those of you who do not know what a cable bite is, a cable bite is a plastic figure that attaches to your iphone cable. The figures come blind packaged, so you had to open them up to see which figure was inside. Vol. 3 features Eevee, Flareon, Jolteon, Vaporeon & Sylveon. Vol. 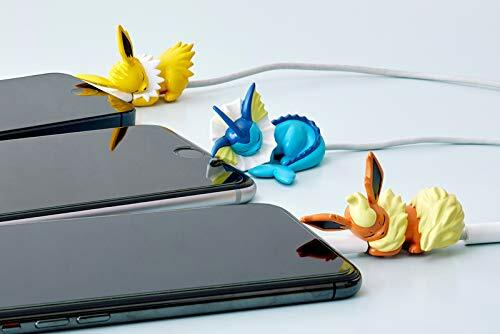 4 features Eevee, Espeon, Umbreon, Leafeon & Glaceon. This is the 3rd and 4th series of sleeping cable bites. The first series featured Umbreon, Eevee, Espeon, Alolan Vulpix, Vulpix & Pikachu. 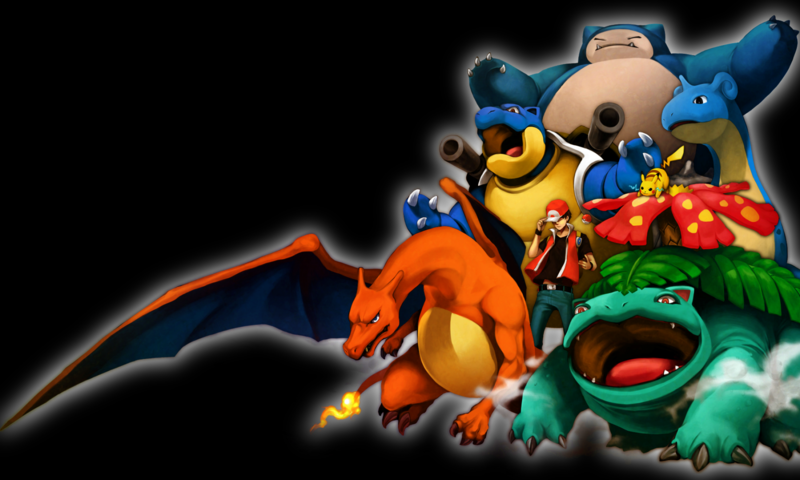 The second series featured Bulbasaur, Charmander, Squirtle, Pichu, Mew & Sylveon. 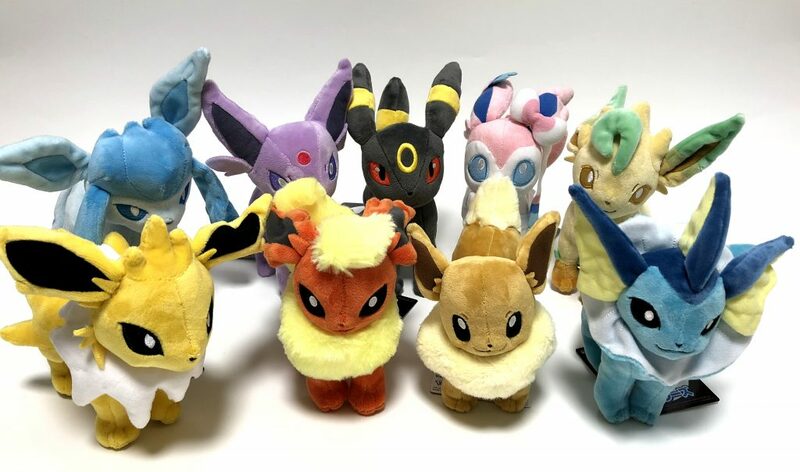 The Pokemon Center made a surprise release of all 9 Eeveelution standing plushies. 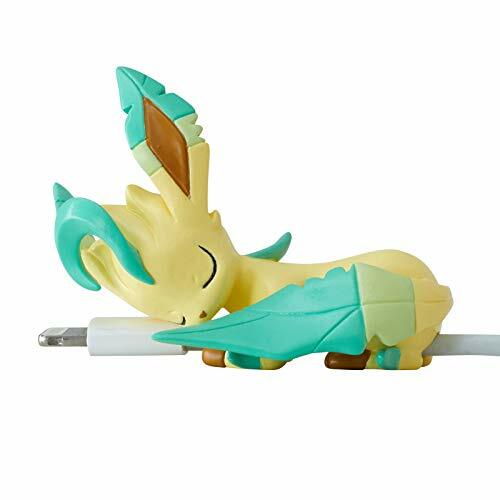 These were not announced on the official Pokemon Center website, so it was a wonderful surprise. Some of you may recognize these plushies from back in 2012 when the Pokemon Center released all 9 standing plushies (Eevee, Espeon, Flareon, Jolteon, Leafeon, Sylveon, Umbreon & Vaporeon). These are very similar, but with some small differences unique to each plushie. 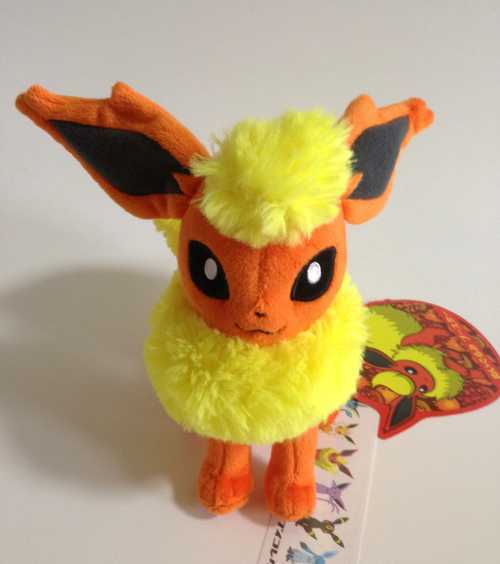 For example, lets take a look at the Flareon plushie. For the most part, they look relatively the same. Apart from the obvious tag being different, the orange body color seems darker in the new version and the yellow fur is also quite different. The eyes and ears are also slightly different as well. The 2018 version seems to also be just slightly smaller than the 2012 version. 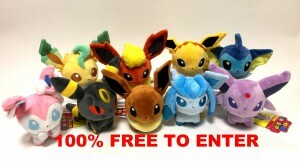 These Eeveelution plushies were released during Obon Holiday in Japan, so they will sell out extremely fast. 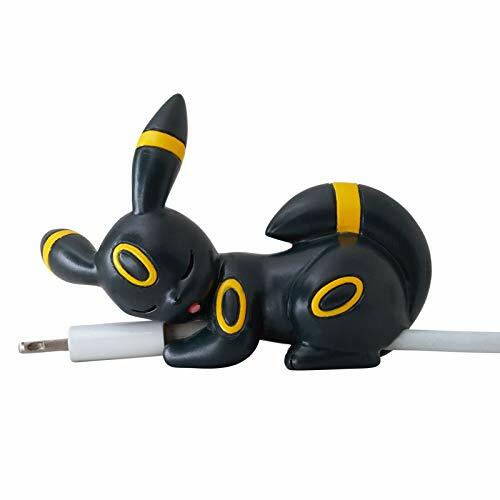 Make sure that you order yours today on Pokevault before they are gone for good. Pokevault.com is having another contest!!!! 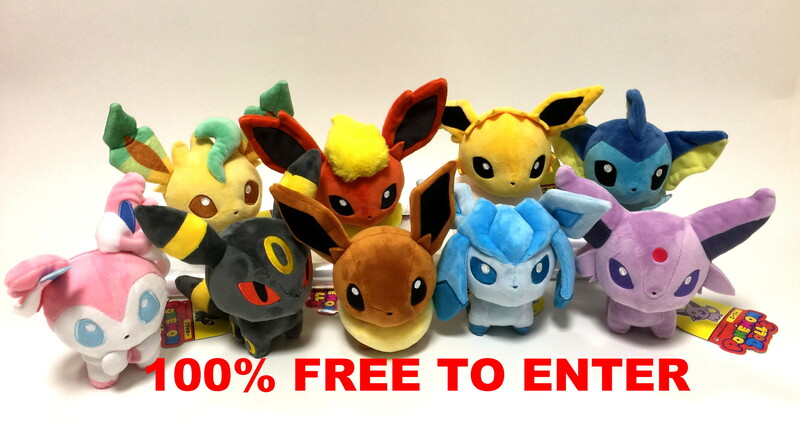 We are giving away a set of 9 Eeveelution Pokedoll Plush Toys (Eevee, Espeon, Flareon, Glaceon, Jolteon, Leafeon, Sylveon, Umbreon & Vaporeon). One lucky winner will take home this awesome set of Japanese Pokemon Center plushies. They are ABSOLUTELY FREE!!! NO PURCHASE NECESSARY!!! The contest starts May 18, 2017 and ends on May 24, 2017 (Japan time). Its 100% free to enter and there is no purchase necessary. 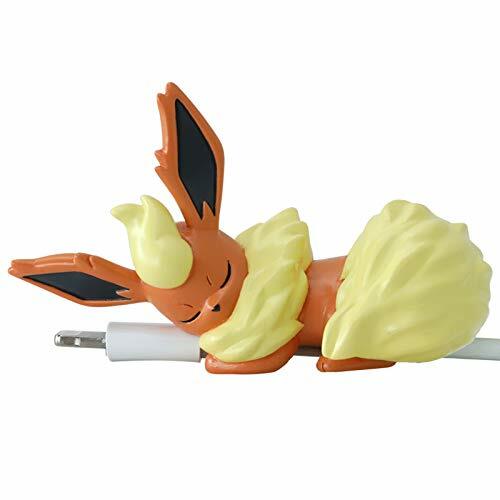 Sorry for posting this so late, but there have been alot of wonderful “Eevee Collection” merchandise released at the Pokemon Centers in Japan. The Pokemon Centers are releasing merchandise in 4 different rounds. So far round one, two and three have been released with round four due out in early December. 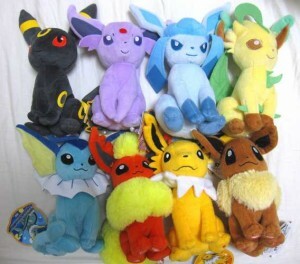 Some of the first merchandise to go on sale were the Takara Tomy eeveelution plushies. 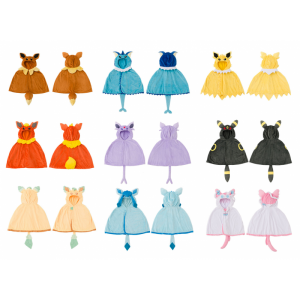 They released all 8 of the eeveelutions (Eevee, Espeon, Flareon, Jolteon, Leafeon, Umbreon and Vaporeon). 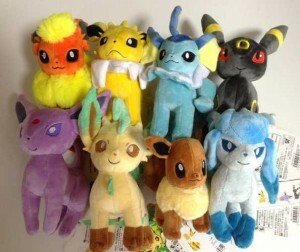 These 8 plushies were sold almost exclusively at the Pokemon Centers in Japan. 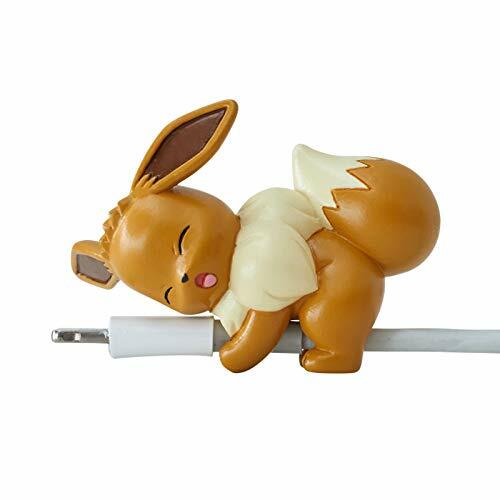 Amazon Japan sold the Eevee plush, but not any of the 7 others. There was a very very limited number of toy stores that also sold them. These plushies are in the sitting position. They are very detailed and well made. Most of them are about 6-7″ tall (15-17cm). 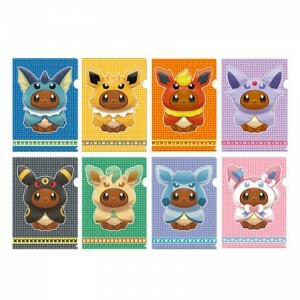 They come with a new special re-designed Takara Tomy paper tag that features the Eeveelution on it. They are relatively soft but are nice and sturdy and well made. Round two was a huge release of merchandise. The Pokemon Center was absolutely crazy. People were pushing and shoving to grab any and everything that they could find. There was a “Pokemon Center” version of all 8 plush characters. This time it was a standing version. 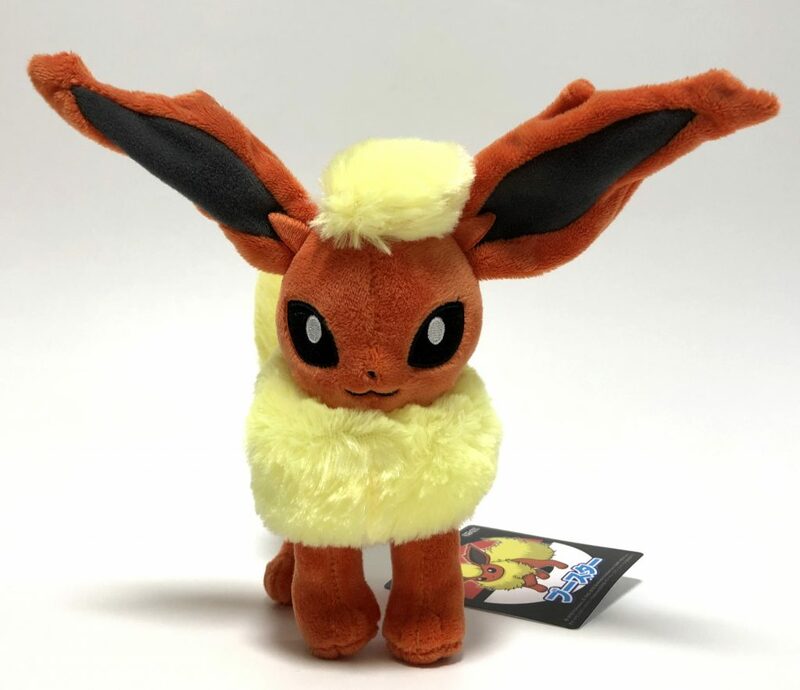 Like the Takara Tomy plushies, the Pokemon Center Eevee plushies also had newly designed very large paper tags in addition to a long white “Eevee Collection” tag. These plushies are slightly smaller than the Takara Tomy version, but are much softer and have better detail. They are very similar to the canvas plushies that were sold a couple years ago, but are bigger. All 8 characters were also made into a set of a coaster and a placemat. These were highly sought after and sold out immediately. They are made of nice fabric. The coaster matches the placemat. Each eeveelution was also featured on plastic cups. These cups are awesome. They are made of melamin which is a type of hard plastic. 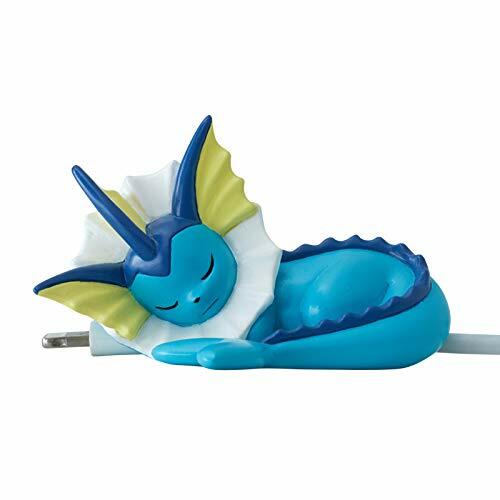 They are very sturdy and the Eeveelution image seems to be printed or painted on the cup, so it will last a long time. There was also a bowl and plate set that also sold out within minutes. One of the best items was the Eevee plush cushion. It is perfect to put on your bed or lay on when you watch tv. Its absolutely stunning. I really recommend it. All 8 Eeveelution mini Pokedoll plush keychains also went on sale the same day. They are perfect to attach to your keyring, suitcase, purse or just about anywhere. Very cute small versions of the Pokedoll plushies that were sold a few years ago. There was also a vanity bag and a mini pouch that featured all 8 Eeveelutions. 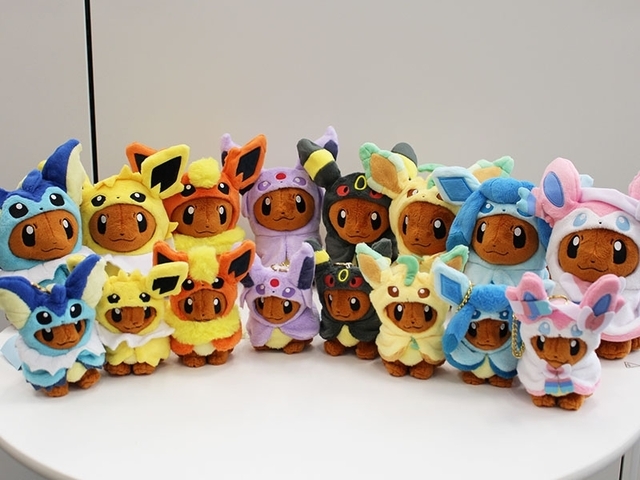 One of the most popular items was the Eeveelution lap blanket. It was a small blanket made to put on your lap or for a very small child. It was made in very limited quantity and was gone within a matter of minutes. Each of the 8 Eeveelutions was also featured on a clear file folder. Its been 3 years since the last Eeveelution file folders were released, so this was a nice surprise. The file folders are size A4 which is the same size as a normal 8.5 x 12 sheet of paper, so these are great to use at school. There was also a limited edition cookie tin that came with Eeveelution shaped cookies, three different Nintendo 3DS cartridge cases and a Nintendo 3DSLL Eevee silicon cover. The third round of goods from the Eevee Collection was Pokemon TCG card gaming supplies. There was an Eevee deck box featuring all the Eeveelution characters and three different sets of Eeveelution deck sleeves. The deck boxes and sleeves sold out in less than 15 minutes with hundreds of people grabbing as many as they could before they were gone. There was also an Eevee Collection 3 ring hard cover type binder that you can store your cards in. The binder also came with 8 limited edition Eeveelution promo cards. 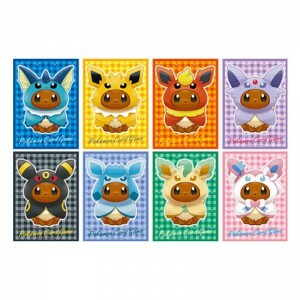 The Eevee one is a holofoil and the other 7 are not. The 9th card will be given away on December 14th with the release of the two new booster pack series. Also, while supplies lasts, if you bought 2000 yen or more worth of Eeveelution items, you received a limited edition Eeveelution postcard. 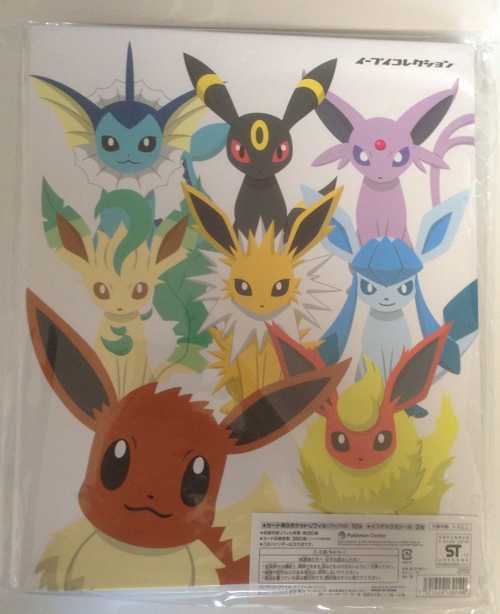 Eevee, Espeon, Flareon, Glaceon, Leafeon, Umbreon and Vaporeon were all featured as well as a the mystery postcard which was a group shot featuring all 8 characters. These postcards are real postcards which can be used. Of course they require a stamp in order to be sent. 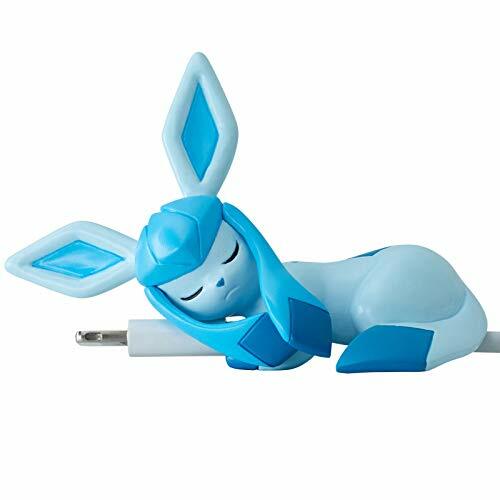 Stay tuned for part 4 of the Eeveelution merchandise. Eevee is by far one of the most popular Pokemon in the, well, Pokemon World of course! This is because of the simple fact of Eevee having over seven different evolutions. Eevee is just a normal type Pokemon, Jolteon is just an electric type Pokemon, Flareon is just a fire type Pokemon, Vaporeon is just a water type Pokemon, Umbreon is just a dark type Pokemon, Espeon is just a psychic type Pokemon, Leafeon is just a grass type Pokemon, and Glaceon is just an ice type Pokemon. What do all these have in common? Eevee! They all evolve through Eevee with an evolution stone, friendship or level up by a special rock. One of these Pokemon we’re going to take a look at is Espeon. Espeon has four legs, much like a bigger for of Eevee, but has a lavender color. It has a red circle on it’s forehead which most likely symbolizes it’s psychic Power. Espeon also has a long fork tail, sort of like a reptile’s tongue. Espeon’s eyes are just a light purple, a bit darker then the lavender color on it’s body. Espeon has long ears, sort of like Pichu, but they are lavender and light purple on the inside. That is just a basic idea of what an Espeon looks like. 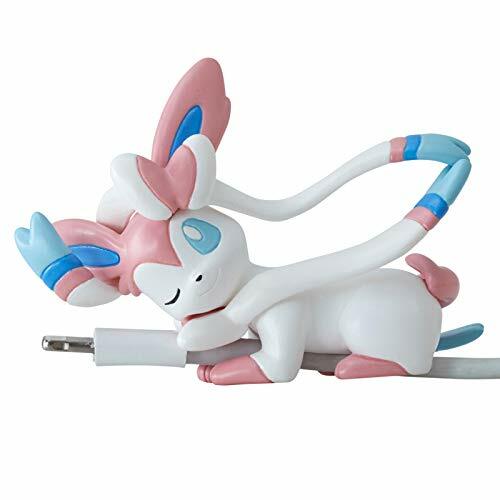 Espeon is also fairly popular in battle because it has the strongest special attack stat of all the Eevee evolutions, except for maybe Glaceon who has high speciall attack as well. But Espeon has a bit more speed then Glaceon so it even outs. When the Sinnoh arc came out, new ideas came with it. So many different Pokemon now had evolutions that they hadn’t had before, by methods unheard of up to that point in the games. Eevee was one of those Pokemon. Apparently, its unstable genetic code would malfunction in certain areas and actually evolve to reflect the elements. The results were pretty impressive. One of those evolutions was Leafeon. Leafeon resembles both cats and foxes. Its brown paws (as if colored with dirt) are small and its creme colored body is slender. Its ears, tail, and forehead appear to be plants and small sprouts are seen growing in different places of its body. Apparently its leaves are quite sharp, as it is able to learn slicing attacks such as Leaf Blade and X-Scissor (though it still lacks the ability to learn the HM Cut). According to its pokedex entries, Leafeon’s cells are very similar to a plant. It sunbathes to use photosynthesis to feed itself, though it will eat leaves if it isn’t near sunlight. Leafeon also are known for cleaning the air surrounding them like plants would and they dislike fighting. Leafeon is tied with Vaporeon and Umbreon for being the tallest Eeveelution, and it shares the same footprints as Umbreon and Glaceon. Its name comes from the word ‘leaf’ and ends with the suffix ‘eon’, which is short for “evolution”, like all the other Eevee evolutions. Last time, I covered the strange mystery that is an Eevee. I will be more specific on how you can get Eevee’s “Eeveelutions” through various games. Through the classic games, a Water Stone would turn Eevee into Vaporeon, the one with lots of HP. 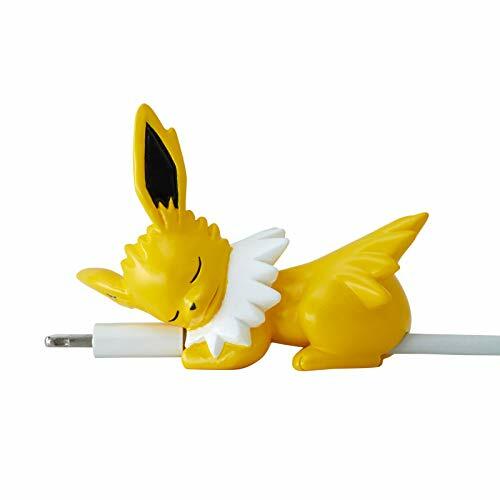 A Thunderstone will turn Eevee into Jolteon, and a Fire Stone, into Flareon. To turn Eevee into Espeon or Umbreon, you need to increase its happiness. Before time-based Pokemon games came out (time is the deciding factor for this evolution), you would need a Sun Stone for it to turn into Espeon, the sly, powerful, Psychic-type, or Umbreon, the well-rounded Dark-type. In games like Pokemon Mystery Dungeon, you would need a Solar or Lunar Ribbon, and of course, feed your Eevee some gummies for its IQ to increase. More specifically, in games (starting from Pokemon Diamond and Pearl Versions) you would need to evolve Eevee between 12pm and 12am; this is considered daytime in Pokemon. On the other hand, 12am to 12pm is considered night time; it’s required you get your Eevee happy enough to turn it into Umbreon. To get the two recent forms, Leafeon and Glaceon, you would need to also make it happy, but you must be near certain stones. Since there are no places with stones in Johto/Kanto (Heart Gold and Soul Silver Versions), it’s impossible to get a Leafeon or Glaceon there; you may need to trade it from Diamond or Pearl version. Eevee is regarded by many as cute, adorable, but most of all, popular. I find myself a liking to Eevee too, since it is definitely one of a kind. Eevee, the Normal-type Evolution Pokemon, can evolve into seven different forms, each with its own strength and element. It all started with the first three: Vaporeon, the Water-type, Jolteon, the Electric-type, and Flareon, the Fire-type. In fact, I remember seeing these on the actual TV show. Team Rocket (the original antagonists) stole Eevee, as well as its evolved companions. Ash and his group were able to catch them and send them blasting off again. Since I was pretty young, I didn’t know what they were until I heard their names. Another encounter was when I first started playing Pokemon Coliseum. As the hero, you will start off with Espeon and Umbreon, the Psychic- and Dark-type evolutions of Eevee. The Sinnoh region is currently the most recent one to feature the last evolutions of Eevee: Leafeon and Glaceon, the Grass- and Ice-type. In the game, Eevee is very rare to come upon.